1. 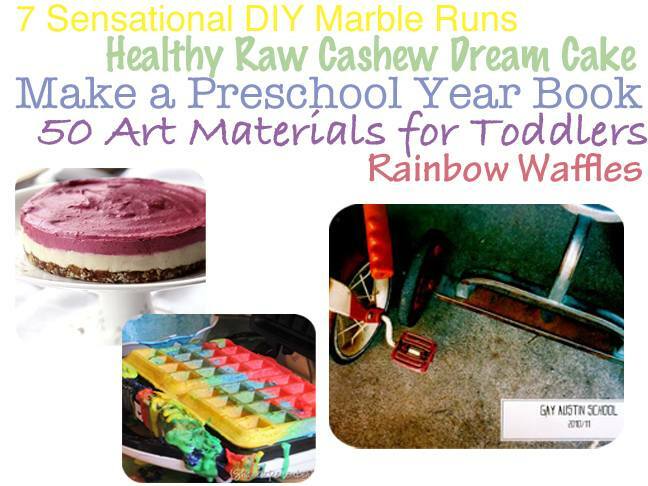 Making a marble run with materials you have on hand at home is a great way to entertain the kids while teaching them about up-cycling. Check out this post for seven sensational examples. 2. Summertime usually means a lot of back yard get-togethers and a lot of dessert. With this beautiful and wholesome raw cashew dream cake, you can feel free to indulge all summer long. 3. This DIY preschool year book is stylish enough for the coffee table. Learn how to make your own here. 4. And speaking of preschoolers – need some help occupying them over the summer break? Here's a list of 50 art materials for toddlers to help you build your playtime arsenal. 5. Finally, summer is a time to kick back and have a little fun. Start your day with these rainbow waffles and you'll be off to a great start.